As a rule, every Wednesday in the dark of 4 a.m., Carl Pellonpaa, age 73, pulls his car into the lot at WLUC-TV, the NBC affiliate in Negaunee, a half-hour west of Marquette. He steers into an unreserved parking spot, reaches for the lunch he packed earlier this morning, then walks amid the blue-green glow of lot lights to the front studio door. Heading inside, Pellonpaa has one thing on his mind – preparing for his weekly TV show, “Suomi Kutsuu, Finland Calling,” a variety show about all things Finnish. The name is something of a redundancy, because Suomi Kutsuu means Finland calling in Finnish. On Wednesday, March 24, 2004, Carl arrives even earlier, this day at 3 a.m. He couldn’t sleep because he’s keyed up thinking about details for the annual “Suomi Kutsuu, Finland Calling” anniversary show, filmed today for airing on Sunday. He heads to his desk, sets down his lunch and goes straight to the editing equipment, a workstation packed into a closet no wider than a yardstick – not especially comfortable for Pellonpaa, who still carries the large frame of the ex-athlete and ex-miner that he is. Pellonpaa burrows in and begins running through the videotape he shot at the show’s anniversary dance held the previous weekend. Much of the show will be comprised of footage from the event, so for the next few hours, he’ll comb through shots of people waltzing, shots of fiddlers and mandolin players, shots of the sandwich table, shots of a guy winning a television. By 8 a.m., he’s finished and walks back to his desk, where a handwritten sign on his chair reads, “Return to Carl’s desk.” “I put that there because my chair kept disappearing,” he says, and then his broad face reveals the disarming, slightly mischievous smile that his fans love. He reaches into his Marimekko (the Finnish company) lunch tote, pulls out a Pepsi, snaps the tab and settles back with his morning sandwich – a midday break when most people are barely out of bed. The routine is one Pellonpaa knows well. His first “Suomi Kutsuu, Finland Calling” ran March 25, 1962, so the 2004 show marks the 42nd anniversary. Pellonpaa has been host for all but nine months in 1963, roughly 2,200 shows’ worth. Fans like to boast that “Suomi Kutsuu, Finland Calling” is the longest-running ethnic variety show in the United States, and they might be right. The Guinness Book of World Records says that “Sábado Gigante”, a Hispanic show, is the longest running variety show in America, but it began broadcasting in August of ’62, five months after “Suomi Kutsuu, Finland Calling” began. One bragging point fans are almost certainly correct on is that the show is the only Finnish language TV show in the nation. For first-time observers, the reasons for the show’s four-plus decades of success may not be readily apparent. In the TV realm, where special effects and rapid image changes rule, Pellonpaa’s show comes off as spare and as simple as his Wednesday morning work ritual. He has a couple of chairs for visitors, some artificial flowers in a vase, a map of Finland and some photos of the nation’s countryside. When musicians play, the camera might focus on, say, an accordion player’s fingers for what seems like minutes, or on a mandolin player’s face for longer than feels comfortable. And though occasionally his guests are Finnish luminaries – a Finnish president and a Finnish prime minister have appeared – more often they are everyday folks, like the Helsinki policeman who was gregarious prior to the show but froze up on air, so his wife had to do all the talking. For loyal viewers, though, there is no mystery to the show’s enduring appeal. The bands playing traditional Finnish music, the interviews, the spoken Finnish language, images from Finland – it all forms a direct connection to the homeland for the large population of Finnish Americans in the Upper Peninsula and Wisconsin. Pellonpaa quotes a 1960 census figure that said 25 percent of the then-300,000 U.P. residents were first or second generation Finns. The show affirms the culture and the viewer’s very sense of self. Of course, there’s also the appeal of friendly Carl Pellonpaa, whom one fan described as “an outgoing Finnish male,” noteworthy in a people of legendarily stoic men. But Pellonpaa’s most significant achievement goes beyond just the popularity of his television show. With the TV show, the dances he sponsors and annual group trips to Finland, Pellonpaa has developed a formula that could be the envy of every immigrant organization in the nation. He has helped create an un-melting piece of ethnic culture afloat in that great homogenizer known as the American melting pot. Carl Pellonpaa lives in Ishpeming, the town where he was born and raised. From his childhood, he remembers it as a place where ethnicities – Finns, Swedes, Cornish and Italians – were distinct, but were also drawn together by the rigors and risks of underground iron mining. The nation’s oldest operating underground iron mine, the Cliff Shaft-Barnum, had its entrance not far from his home on Jasper Street. Finns like to say they take care of their own, referring to both their communities and their families, and such was evident in Carl’s life. In the house where he grew up the youngest of four children, his parents – both Finnish immigrants – lived on the first floor. His sister and her husband lived upstairs. His brother lived across the street. His other sister lived next door. A cousin lived next door on the other side. “I call it my comfort zone,” he says. Pellonpaa’s broadcasting skills were identified early, when he was still in high school. One day a teacher asked several kids to go into a room and take turns reading into a microphone. When he emerged from the reading, a local radio director was waiting to offer him a job – unbeknownst to Pellonpaa, he had been auditioning. He accepted and started the next Monday. He was pleased to have a job, “but it was nothing more than that,” Pellonpaa says, because he already had a passion – pitching baseball. His sole dream was to play on a major league team. When the Boston Braves held tryouts in Negaunee in 1949, the 17-year-old Pellonpaa went and impressed the scouts. “There was no question in my mind that I could do it. I had a good fastball,” he says. He pauses, thinking back to the day. “I could bring it in.” The Braves offered him a contract to a class D team, and he was to report the following spring, but fate intervened. That fall, on a frosty October morning, he went rabbit hunting with his buddies. The crew was walking back to camp, single file, and a rabbit jumped. They shot it, and Pellonpaa went to fetch the kill, but as he neared it, the rabbit jumped up and began running. Pellonpaa yelled, “There he goes!” His pal shot at the rabbit again, thinking he could shoot over Pellonpaa. “But he hit me in the head and shoulder. BB’s lodged in my shoulder joint.” It was the shoulder of his throwing arm. The body’s natural reaction is to coat such an intrusion, which caused bursitis. The Finns have something they call Sisu. It’s a blend of pride, courage, determination and do-the-right-thingness. Sisu fuels the individual, sets guidelines for behavior and binds the community. And it took all the Sisu young Pellonpaa could muster to seal off that dream and find a new one to pull him into adulthood. And the Sisu worked. Pellonpaa soon developed an appreciation for mining and miners themselves. One of Carl’s oft-quoted sayings is that mining was the best job he ever had “because the job was there when you arrive in the morning and was there when you left at night.” That was true for the next seven years, during which he married a svelte Swede named Doris Holmgren and had two children. Then in 1958 the mine laid him off. He moved to Waukegan, Illinois, to work at Abbott Laboratories. But Doris was pregnant with their third child and Carl’s mother was ill, so Doris stayed with the kids in the U.P. The arrangement was trying, and Carl returned home by 1959. To make the move back, Pellonpaa turned to his other natural talent, radio, and convinced his former employer, WJPD, to put him on air again. He worked a morning show from a mobile home alongside U.S. 41. “I’d say hi to the traffic,” he says. “Hi to the blue Chevy. Hi to the purple Ford.” Over time, people began to call in and ask Pellonpaa to say things about their buddies from the mine, and they’d describe the guy’s car. “When they passed by I would talk about them. Word got around in the mine, and I built a following there,” he says. Within a year, Pellonpaa applied at WLUC-TV, or TV6, as locals call it, and he began as a weatherman. 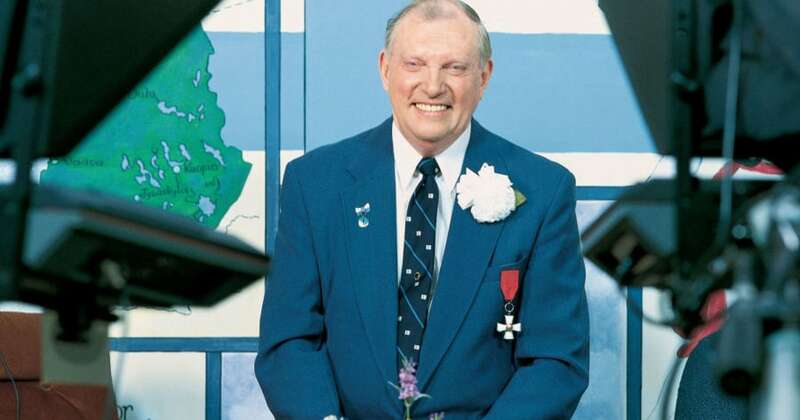 Then in 1962, the station manager called him into his office to say that Tom Quayle, a travel agent who owned several agencies in the Upper Peninsula, said he could sell trips to Finland if TV6 had a Finnish TV show he could advertise on. Pellonpaa and Eugene Sinervo took the concept and launched a half-hour show. It caught on quickly, and by fall, TV6 gave it a full hour. The formula has remained virtually the same since then, a mix of music, talk and images from Finland. But things were especially quaint in the early days. Radio had been a snap, Pellonpaa says. “Talk a little bit and then put on a record and relax.” But in television, the people can see the host. “What do you show when you play music?” Back then, the TV crew would just open a book about Finland and focus on a still photo that Pellonpaa had bookmarked. “Live action” consisted of turning the page to a different photo. If somebody’s hand slipped while holding the book, the audience saw the flub. If somebody bumped the record player, the music skipped. When Pellonpaa brought his German shepherd onto the show at Christmas, and the dog nearly attacked Santa when he tried to enter the set, well, the jolly old elf just didn’t make it onto the show that year. In 1964, Pellonpaa figured that people liked the music so much that it made sense to sponsor a dance. He rented the Ishpeming Armory and hired a band. Then, in the middle of the dance, a man dropped dead. An ambulance took away the body, but the Finns know that life is hard and you must persevere – Sisu. The music continued, people kept dancing. But the death rattled him. “I thought, Geeze, is that a sign? Is somebody trying to tell me something?” he says. It was a passing notion, and shortly afterward “Suomi Kutsuu, Finland Calling” sponsored another dance. During that dance, a woman dropped dead. “I said, ‘That’s it, we are having no more dances,'” he says. But a friend gave counsel: “They died with their boots on, they were enjoying themselves.” The dances continued and have become an integral part of the show’s appeal, and nobody has died since. The dances give Pellonpaa a chance to shake hands, meet friends and allow people to bring their friends. “I’ve never wanted to give people the impression that I’m unreachable,” he says. The largest dance took place in South Range, where 800 people attended. “That whole floor shook,” Pellonpaa says. It’s Sunday, March 21, and the “Suomi Kutsuu, Finland Calling” anniversary dance is underway. The previous day a foot of snow fell across the western Upper Peninsula and Northern Wisconsin, but today the sun shines bright, and the roads are clear. A couple of hundred people, mostly senior citizens, have traveled – some for two or three hours – to the Ishpeming Elks Lodge to see Carl Pellonpaa and hear Finnish music. The songs sound unexpectedly Eastern European, flavored with a brooding-but-lively, gypsy sensibility. Many are three-beat numbers called hambos – Finnish waltzes – and mazurkas – Finnish polkas. During a break between sets, Oren Tikkanen, a musician and musical historian, sits at a table with a 7-Up at his elbow. To many Finns, this music takes on meaning that goes well beyond a pleasing sound, he explains. During the 1800’s, some Finnish leaders set out to create a nation where, until then, only tribes had ruled. They created a body of stories, lore and music called the Kalevala. “The music helped define Finns and gave legitimacy to the language,” he says. “Even today, the nation has a political objective to train musicians to preserve traditional music.” As for Tikkanen’s band, it probably wouldn’t exist without Pellonpaa’s dances. As Tikkanen speaks, Pellonpaa, in his trademark blue blazer, stands in front of the room, filling the downtime with prize drawings. He holds up a hand-knitted purse. “Look at that, she knitted it just the way I showed her,” he says, and then breaks into a story. “I always wondered why I enjoyed ski jumping so much. Well, I found out that when I was a baby, my sister and brother used to throw me from one bed to the other. Get it? Flying through the air?” He arcs an arm through the air. A mix of groan and low laughter runs through the crowd. Kenneth and Taimi Walimaa take the opportunity to rest on chairs at the bar. “We’ve watched the show since day one,” Kenneth says. “The whole U.P. watches this on their TVs. It keeps the Finnish people together.” The Walimaas’ family history embodies the kind of Finnish legacy that Pellonpaa hopes to preserve. Both Kenneth and Taimi had grandfathers who came from Finland a century ago. Like too many Finnish men, Kenneth’s father was killed in a mine accident, this one a 1926 disaster that took the lives of 51 miners. But the Finns stuck together. His mother didn’t even have to learn English to make a living – Sisu. Once, Kenneth and Taimi went to Finland on a “Suomi Kutsuu, Finland Calling” group trip, and when they did they visited Kenneth’s ancestral homestead. Only a stone foundation remained. He took a piece and made it into jewelry. In the midst of the storytelling, the couple hears Pellonpaa announce the grand march. They stop speaking midsentence. “It’s the grand march,” they say, and abruptly head to the dance floor, as if there is no choice, like salmon called back to the river. On the dance floor, people pair up and form a wide circle that rotates to the slow tempo of the march. Pellonpaa stands in the middle of it all, a video camera at his eye. As 6 p.m. nears, sunlight shines through the west window. It backlights the American flag, illuminates the sheet music, casts a golden glow around the mandolin player who’s swaying to the rhythm of the waltz. Half the people have left. Many have a long drive, and it will be dark by 7:30. But still others can’t leave the Elks Lodge. They dance, 1-2-3 to the beat, six hours after it all began. At 5:55, Pellonpaa walks around to each table, shaking hands. “Thank you” he says, over and over again. “Thanks for coming.” Finally, the band plays “Goodnight Irene.” Pellonpaa stands at the front of the room, hands on his hips, a subtle smile, a glow in his eye. Cut again to where this story opened, production day for the anniversary show. Midmorning is here, and the action is speeding up. Pellonpaa’s guests have arrived. He greets them in Finnish and takes them to his office to relax before airtime. The two men are from Finland, each representing a business college. Making chitchat, Pellonpaa is already wearing his blue blazer with two lapel pins, one from the Finnish president that reads Knight of the Order of the Lion White Rose and the other from the League of Finnish American Societies. Out on the set, production manager Jeff Collins is taping a white plastic tablecloth to the table that will hold the cake. He then sets down three arrangements of artificial flowers. A woman brings in the cake, a large rectangle with white frosting and blue writing – the Finnish national colors – made by Carla upstairs. It reads, “Finland Calling. Celebrating 42 years with Carl Pellonpaa.” A woman arranges paper plates and plastic forks. At some point, somebody says, “10 seconds.” When Pellonpaa begins talking, it’s first in Finnish, then a brief translation in English. He talks about the 42nd anniversary. He reminds people to turn their clocks forward next Saturday, or they’ll miss the next show. He reads birthday greetings people have sent in. He talks with his guests, about their schools, about Finland. All the time, it’s Finnish then English. Soon there’s video footage from the dance, and there it is, the grand march, people moving in the big, slow, counterclockwise rotation. Who will make it on TV to prove they attended this centerpiece of Finnish-American ritual? Will Patricia Maki? Vilho Heikkinen? Seija Jarvenpaa? Richard Salo? John Hongisto? The Walimaas? All will be watching closely. Note: This article was first published in April 2005, and was updated for the web February 2008.